Recent media coverage on risks of waterbirth has reinforced the need to ensure robust research on the safety of hydrotherapy in labor and birth, and the importance of appropriate infection protocols. We are saddened to learn of the two infants who contracted Legionnaires’ disease in Arizona after birth in the water. According to media coverage, both infants recovered after receiving antibiotic treatment. Our hearts are with the families and their midwives. The Midwives Alliance of North America takes seriously the safety of all birthing families. Toward that end, we maintain a data registry that can be used for research and the development of evidence-informed practice guidelines that promote healthy outcomes for pregnant families. It is important to note that the two recent Legionnaires’ disease diagnoses following waterbirth are what researchers call “case reports.” A case report describes the outcomes for one single patient, and are not generally used to change clinical guidelines, because without a large sample size, and without a control group, generalizations cannot be made from just the one person’s (or in this case, two people’s) experiences. Research helps to inform practice and the creation of evidence-based guidelines for safety in birth practices. In 2016, a joint Model Practice Template for Hydrotherapy in Labor and Birth was published in the Journal of Midwifery & Women’s Health by the American Association of Birth Centers (AABC), the American College of Nurse-Midwives (ACNM), the Midwives Alliance of North America (MANA), and the National Association of Certified Professional Midwives (NACPM). This model practice template provides detailed guidelines for mitigating risks and promoting safety during waterbirth, including proper infection prevention protocols. 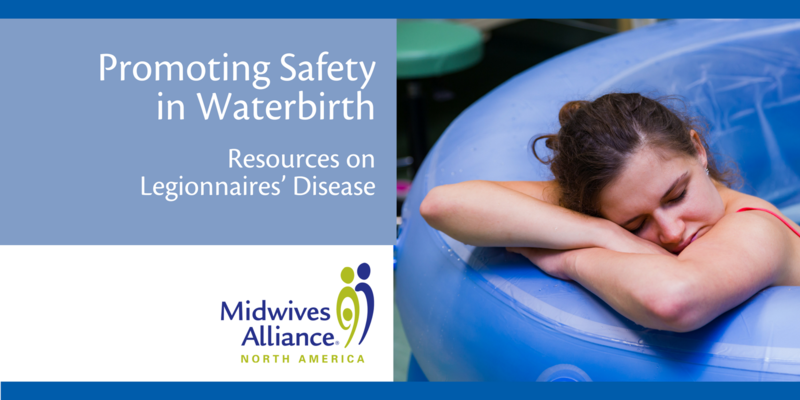 Families considering hydrotherapy in labor and birth can find helpful information in the joint Midwives Alliance of North America & Citizens for Midwifery Position Statement on Water Immersion During Labor and Birth. Resources contained in this position statement can help childbearing families make an informed decision about waterbirth. MANA reiterates the importance of adherence to best practices for safe waterbirth, including the use of appropriate infection prevention standards for all births.